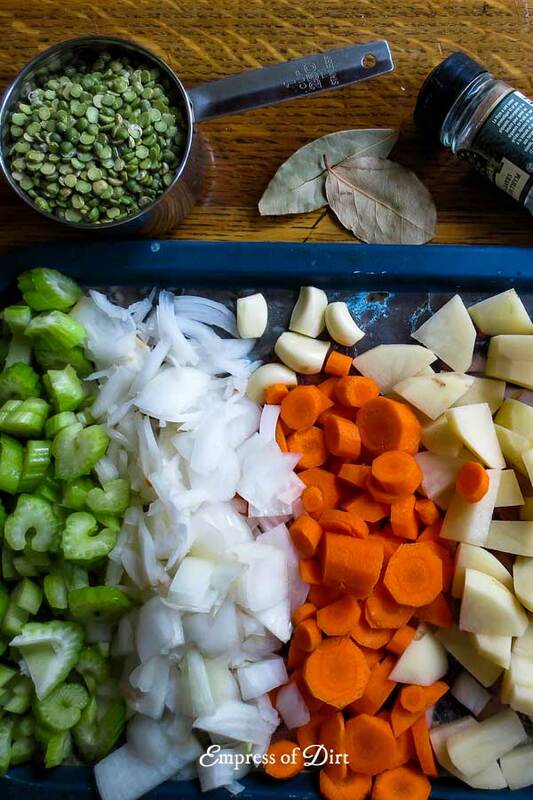 This split pea vegetarian and vegan soup is quick to make and delicious as a hearty snack or dinner. For more ideas, also see 12 Healthy & Delicious Vegetarian Soup Recipes. The key to making any day better is to wake up and decide what you will be having for dinner and making the necessary preparations. With dinner planned, everything else falls into place. The very definition of a crisis brewing is to arrive at the appointed eating time without a plan or proper ingredients. My sister Meg gave me this recipe. I like to prepare it in the morning knowing it will be perfect by evening. I love it because it’s everything that’s delicious about pea soup without greasy ham in it. You can make it vegetarian or vegan (just omit the butter), and either way, it’s delish and keeps in the fridge for a few days. I don’t think I’ve ever made it the same way twice. I just use whatever veggies I have on hand. Depending on how much liquid (water or broth) is added, will determine whether it’s more of a soup or a stewp (a thick stew-like soup). If you add potatoes, it’s pretty much a given you’re having stewp. Which is fine. 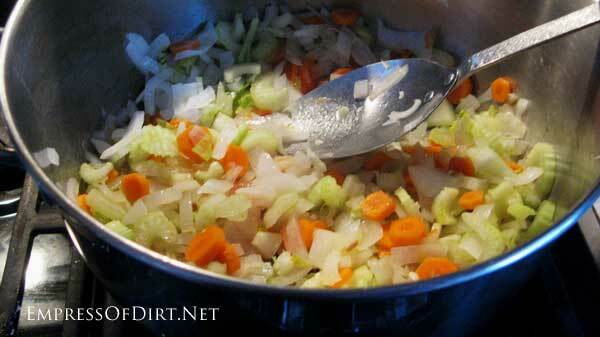 If the veggies are quite fresh and flavourful, I use water instead of broth. If the veggies are lacking in vibrance, broth saves the day. In a soup pot, soften onion and garlic in some oil and/or butter. 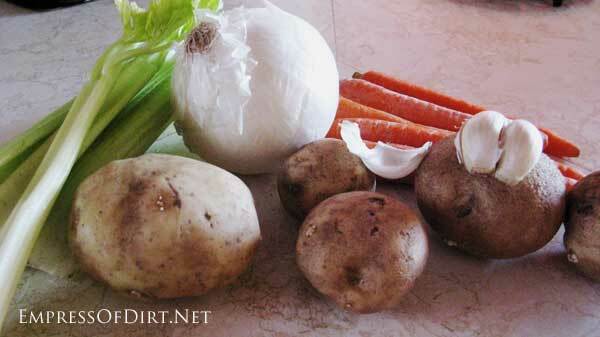 Add carrots, celery, and potato (peel them if you prefer). Cook on medium-high, stirring until tender-ish. 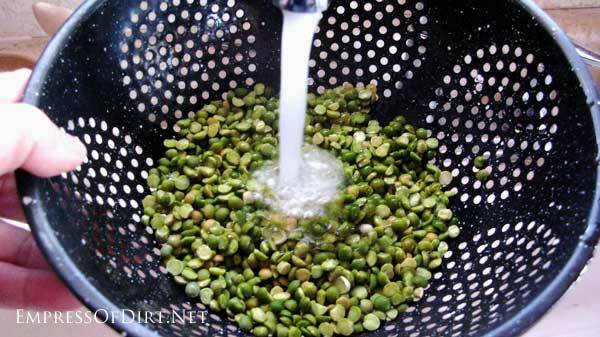 Rinse split peas with water. Remove weird looking ones. 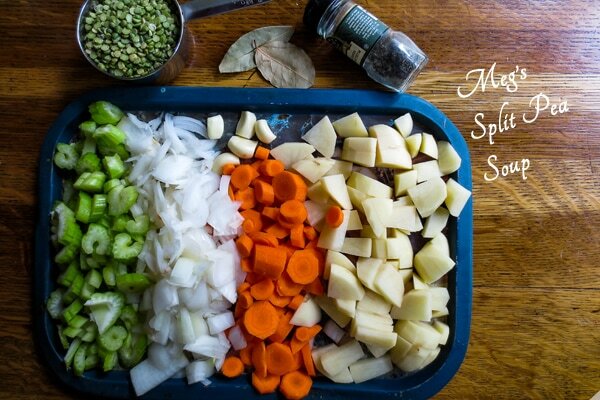 Add split peas, seasonings, and water or broth. Bring to boil, then simmer for 2-3 hours until split peas are tender. Meg serves the soup with her delightful, homemade cornbread. Personally, I have to avoid the cornbread because I end up wanting a bite with every taste of soup! Oink. Oink. Love this recipe, and I’m like you with substituting what veggies are in the fridge. Have you tired the Yumprint plugin? You add your recipe to it and then others just have to click to print it out. It works great. 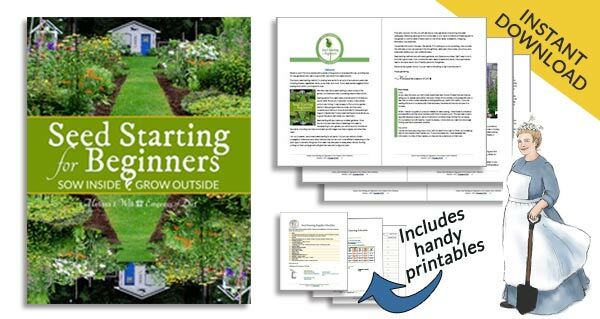 Hi Linda, I’ve been debating between EasyRecipe and Ziplist Recipe (plugins). Haven’t been ready to commit yet. Always the fear of entering all the info in a plugin and then having the plugin disappear…. 🙂 For now, there is a Print button at the bottom of every post that allows selective printing. Have you tried Yumprint? I know what you mean about plugins vanishing or not working with the latest updates of a theme. Many don’t work with my theme of Headway. I do like the Print friendly buttons with the option to remove what you don’t want, like lots of extra photos that use up ink.